Approximately 500 waste recyclers or pickers will take to the streets of Pietermaritzburg, South Africa, this week Thursday, December 11th, 2014, after three years of waiting for the construction of a materials recycling facility (MRF) at the New England Road landfill site. This march is targeted at the provincial Department of Cooperative Governance and Traditional Affairs (CoGTA) which has neglected its oversight responsibility over the local and district municipalities in Pietermaritzburg, and also ignored the responsibilities of the two municipalities within this agreement. Financing of R21 million from CoGTA for the Hlanganani ma-Afrika Waste Cooperative as sole beneficiaries of the MRF was agreed upon between all stakeholders involved. Msunduzi Local Municipality allocated land next to the landfill site for construction, however, uMgungundlovu District Municipality has not indicated any intention of beginning the project since 2011 despite site hand over and appointment of a construction company by the district. About 80 members of the cooperative will be joined in solidarity by the rest of the waste pickers from the landfill and the public is encouraged to support and join the protest that will start at 9H00 on Woodhouse road along SPACA and Scottsville race course joining Boshoff street ending at the Pietermaritzburg city hall at 12H00. Having an MRF at the landfill site means that recyclable waste will be diverted from the landfill, therefore, creating better working conditions and improved incomes. Expansion of the cooperative membership is a future objective in order that no waste pickers are found on the landfill but rather at the MRF. Accidents at the landfill have been in the news in the last three months following the death of one waste picker who was run over by a compactor and critically crippling another. An MRF will prevent all such incidents because MRF will bring about formalisation of waste pickers work. Despite various attempts to progress the project into implementation, groundWork, the local Pietermaritzburg cooperative and the national body of waste pickers – the South African Waste Pickers’ Association – will be handing over the memorandum to COGTA, UMgungundlovu and uMsunduzi municipalities. The national movement of waste pickers, the South African Waste Pickers’ Association (SAWPA) and environmental justice NGO, groundWork, are calling for a construction of the MRF projects to protect the livelihoods of recyclers, pose a major health risk as a result of accidents. 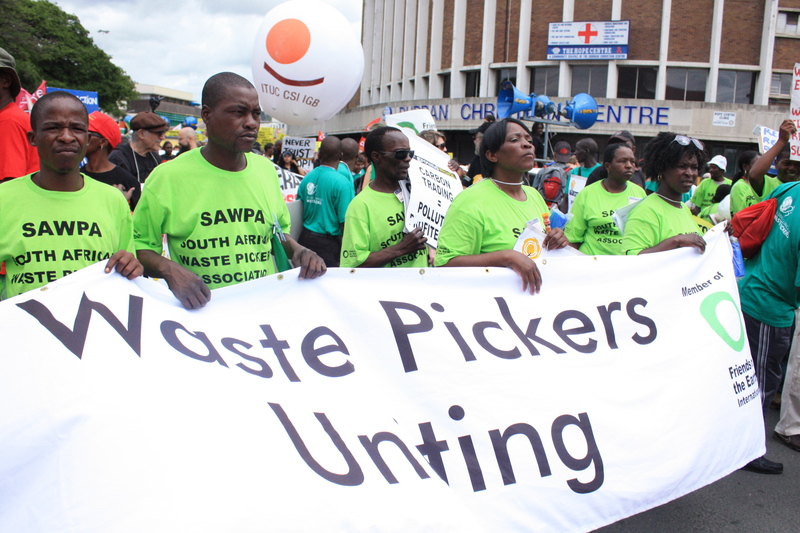 The South African Waste Pickers’ Association (SAWPA) is a national movement of people working on waste dumps and in streets collecting waste and earning an income from selling this waste material for recycling. It has over 10 000 affiliates from all provinces, except the Northern Cape. groundWork is an environmental justice organisation working with community people from around South Africa, and increasingly Southern Africa, on environmental justice and human rights issues focusing on Air Quality, Climate and Energy Justice, Waste and Environmental Health. groundWork is the South African member of Friends of the Earth International and a member of the Global Anti Incineration Alliance (GAIA).